North Korea test-fired a seventh missile Wednesday, South Korean officials said, intensifying the furor ignited when the reclusive regime launched at least six missiles earlier in the day. Japanese Prime Minister Junichiro Koizumi as well as an official at the South Korea Joint Chiefs of Staff confirmed the seventh test. Yonhap news agency said the missile was medium-range, and Japan's Kyodo News agency reported that it landed six minutes after launch. Koizumi told reporters that North Korea should respect a moratorium on missile launches, and said continued dialogue was needed. "To respect the moratorium is to the benefit of both countries,'' Koizumi said, adding he "deeply regretted" North Korea's missile test. "Whatever its intentions or thinking might be, North Korea gains nothing from such an act," he said. "North Korea should keep that in mind." The seventh test comes after a North Korean foreign ministry official had defended North Korea's missile tests as a matter of national sovereignty, reports a Japanese TV station aired in South Korea. The test also follows a warning by the U.S. ambassador to Japan that United States reserves the right to defend itself and its allies. The Japanese TBS network, broadcast by South Korea's YTN, showed Ri Pyong Dok, a researcher on Japanese affairs at the North's Foreign Ministry, saying no one can interfere in Pyongyang's missile program. The report did not name the official or provide further details. The confirmation would be the first by the North, which is believed to have launched at least six missiles, including a long-range Taepodong 2, early Wednesday morning. About 35 seconds after the launch, officials say the ICBM either failed outright or was aborted by plan, reports CBS News correspondent Wyatt Andrews. It did not reach deep space and posed no danger to Japan or the U.S. The North also tested five smaller missiles in an exercise the White House called "provocative" but not an immediate threat. The world also needs to speak with "one voice'' in response to the missile tests, Schieffer added. The isolated communist nation carried out the tests as the U.S. celebrated the Fourth of July and launched the space shuttle. Joseph Cirincione, an arms expert at the Center for American Progress, tells CBS' Dan Raviv that there's a reason this happened on the Fourth of July. "They know this is our national holiday. They want to remind us that they're still there." None of the missiles made it as far as Japan, all crashing into the Sea of Japan separating the island from the Korean Peninsula, officials said. The U.S. administration made it clear that its response would not involve military action as President Bush consulted with National Security Adviser Stephen Hadley, Secretary of State Condoleezza Rice and Defense Secretary Donald H. Rumsfeld. The State Department said Rice conferred with her counterparts from China, Japan, South Korea and Russia. "It wasn't that he (the president) was surprised because we've seen this coming for a while," Hadley said. "I think his instinct is that this just shows the defiance of the international community by North Korea." "We do consider it provocative behavior," Hadley said. Later the White House issued a statement condemning North Korea's "unwillingness to heed calls for restraint from the international community" and accusing North Korea of trying to "intimidate other states." The U.N. Security Council called an emergency meeting for Wednesday morning. Tuesday night U.S. Ambassador John Bolton was in urgent consultations with Security Council members and on a conference call with the United Kingdom and France — the "P3" — in order to gather information to determine next steps, reports CBS News Foreign Affairs Analyst Pamela Falk. "The challenge for U.S. negotiators will be to determine how to both protect the American public and to get the North Koreans back to the 6-party talks in light of the dangerous provocation that was caused by the July 4th launch of missiles," said Falk. "The next step is likely to be diplomacy and all hands on deck at the U.N. Security Council on Wednesday morning, if not before." "The reason that the launch is so threatening is because of North Korea's nuclear capability and because they pulled out of the Non Proliferation Treaty three years ago and, as a result, there is no confirmation of what they are up to," added Falk. Japan lodged a protest with the North Korean Embassy in Beijing on Wednesday over the North's missile launches, calling them a problem for regional security, a Japanese Embassy official said. The protest accused Pyongyang of violating a joint 2002 declaration that called for improved ties between the North and Japan, which have no diplomatic relations, said the official, who spoke on customary condition of anonymity. "It is a great problem that North Korea launched missiles in spite of warnings by Japan and other countries. This is a problem for Japan's security and international peace and stability," the official said, reading from the formal protest letter. Japan also stopped chartered flights from North Korea and banned a North Korean ferry from entering its waters for six months, chief government spokesman Shinzo Abe said. The North Korean ferry is a major conduit of trade between the two countries, which have no diplomatic relations. South Korea said the launches would further deepen its neighbor's international isolation, and Australia and Russia denounced the tests as provocative. Australia's foreign minister said he expected North Korea would conduct more such tests before the end of the week. "We think they probably do intend to launch more missiles in the next day or two," Foreign Minister Alexander Downer said after phoning North Korea's ambassador to Australia to lodge a protest. The North has been in a standoff with the West over North Korea's nuclear program. And the rhetoric has grown increasingly strident with the North vowing Monday to respond with an "annihilating" nuclear strike if it is attacked pre-emptively by the United States. Talks on the issue — held between North Korea, South Korea, China, the United States, Russia and Japan — have been stalled since last year over Pyongyang's insistence that Washington drop financial sanctions against it. "North Korea wants to get the U.S. to direct bilateral negotiations by using the missile card," said Paik Hak-soon, a North Korea expert at the Seoul-based Sejong Institute. "Timing the launch date on July 4 is an attempt to apply maximum pressure on the U.S. government." U.S. nuclear envoy Christopher Hill was to leave Washington for the region later on Wednesday. Hadley said the long-range missile was the Taepodong-2, which failed 35 seconds after launch. Experts believe the missile — North Korea's most advanced with a range of up to 9,320 miles — could reach the United States with a light payload. The State Department said the smaller missiles include Scuds, which could target South Korea, and Rodongs, which has a range of about 620 miles and could target Japan. The launch came after weeks of speculation that the North was preparing to test the Taepodong-2 from a site on its northeast coast. U.S. and Japanese officials said six missiles were fired in all, launched over a four-hour period beginning about 3:30 a.m. Wednesday, or 2:30 p.m. Tuesday ET. The North American Aerospace Defense Command — which monitors the skies for threats to North American security — said it has been on heightened alert for about two weeks and not because of the latest tests. If the timing is correct, the North Korean missiles were launched within minutes of Tuesday's liftoff of Discovery, which blasted into orbit from Cape Canaveral in the first U.S. space shuttle launch in a year. Hadley suggested the tests might have been an attempt to grab the international spotlight. 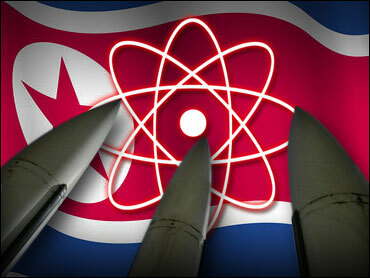 "It's very difficult to know what the North Koreans think they are doing this for," Hadley said. "Obviously, it is a bit of an effort to get attention, perhaps because so much attention has been focused on the Iranians." North Korea's missile program is based on Scud technology provided by the former Soviet Union or Egypt, according to American and South Korean officials. North Korea started its Rodong-1 missile project in the late 1980s and test-fired the missile for the first time in 1993. North Korea had observed a moratorium on long-range missile launches since 1999. It shocked the world in 1998 by firing a Taepodong missile over Japan and into the Pacific Ocean.